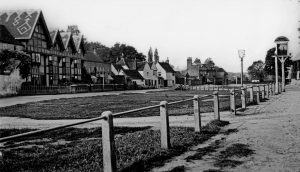 It’s hard to believe that Datchet’s Greens (now known as Gossip, Memorial, Jubilee and North Green) were not always there, but in fact they are much more recent creations than many of the buildings around them. Nobody set out to make the middle of the village as attractive as it is now, but only to deal with the problems caused by the old watercourse running through it and widening to a pool in the middle. It was sometimes known as the ‘Hollow Way’ because it ran well below the level of the land. It was reported in the mid-1700s that the fence in front of the Manor House was broken down and the village children were in danger of falling in. However, it wasn’t so much the nuisance of the stream as the high cost of constantly repairing the road bridge over it, which led the Barker Bridge House Trustees to a radical solution. At the time, all the bridges referred to in the Trust’s minutes were called an arch, rather than a bridge, and a barrel arch was either a short brick tunnel or a longer cylinder, like a drainpipe – or a barrel. It was in the 1830s that the Trustees set Daniel Boulter, the local builder, to culvert the watercourse in an ‘arch or sewer’ through the village. Samuel Osborn said that ‘the sewerage goes through one of the barrels of the old bridge’, although this cannot have been sewerage in the modern sense. 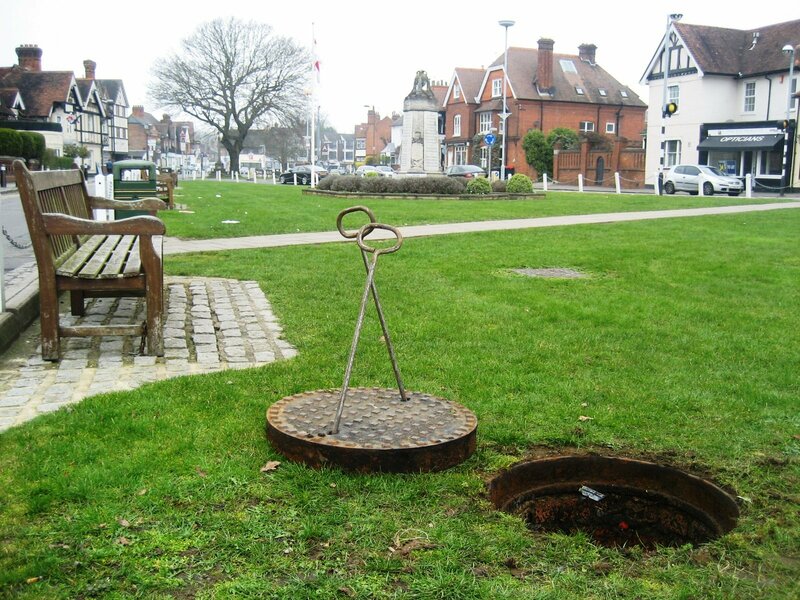 By 1838 Boulter had built a cylindrical brick drain, three feet in diameter and 182 yards long, from the middle of the village to somewhere near the school, which was built in 1843. Once the brick structure was laid and taking the flow, the space all over and around it was filled with rubbish, bushes, road scrapings and soil, all of which created the level space which would become a village green. All the materials, carting and labour was paid for by the Trust, and their funds were described as ‘exhausted’. The Rev Isaac Gosset (who founded the school a few years later) offered a £100 rescue loan, a huge amount at the time. 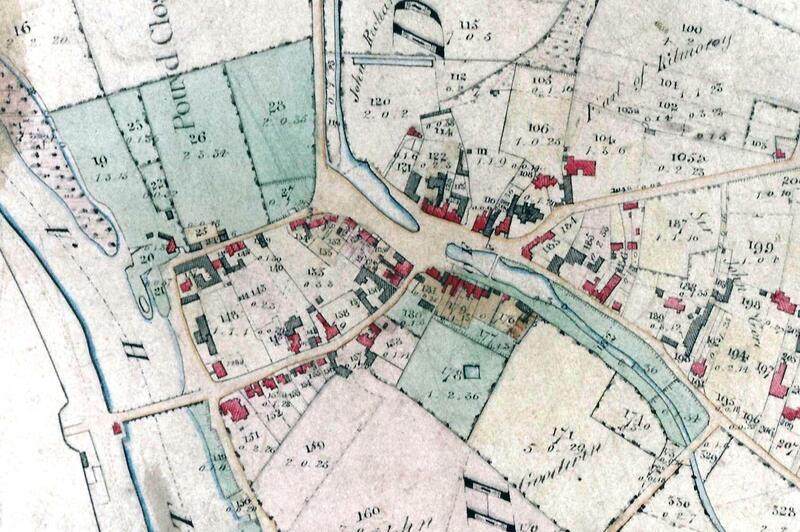 Then in 1847 Daniel Boulter was paid for building ‘an arch or sewer to the end of the road to Upton’, (Slough Road). This was an extension from the middle of the village westwards, perhaps near to the foot of Priory Way. Finally, in 1850, three of the Trustees, including Rev Gosset, ‘looked at the sewer, and finding much stagnant and offensive water at the east end, they resolved to continue the arch as far as to cross the occupation road’. This road was the modern Green Lane, so the last section of the culvert ran from near the front of the school to where it still empties into the ditch near the Health Centre and Youth Club. This final eastern section lies under the pleasant tree-lined green space lining Horton Road from the Library down past the car park, which is still known as The Cut. This name arose because after the stream had been channelled into a new brick drain, the space above it was not completely filled in as it was through the rest of the village. A deep ‘cut’ or depression ran the length of this area which was eventually filled with rubbish and levelled in 1939. 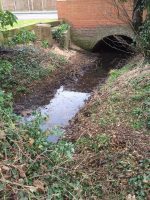 The old description of the culvert as a barrel arch is still used, often by local authorities in discussing who should pay for it to be cleared out. 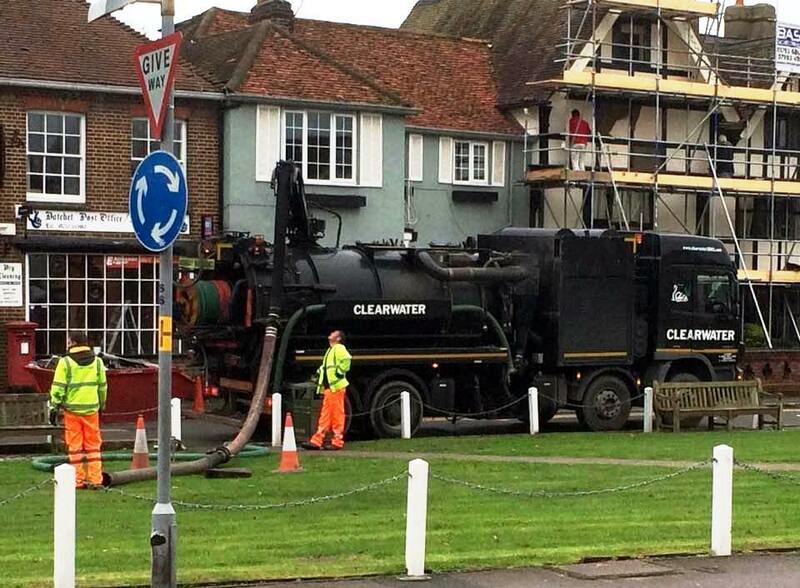 (Currently, the Royal Borough is responsible.) One of the reasons it silts up so easily is that it was built in three sections. The Trustees and their local builder may have understood the angle of drop needed for the water to flow satisfactorily, but by building the middle first and then adding each end separately, there was no means of adjusting the angle later. At the eastern end the flow is particularly sluggish as there was only room for a shallow drop into the ditch which already existed. 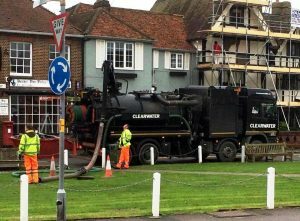 Drain clearing contractors have also reported that the brickwork itself is decaying and causing blockage; it can no longer take the amount of surface water that now pours into it from the roads, and all the filth from the gutters runs on into the ditch across the Recreation Ground. The line of the barrel arch can be followed across the Greens by the large round manhole covers giving access down into it. The 1870s photo (left) shows the newly-created Green, about 30 years after becoming dry land. 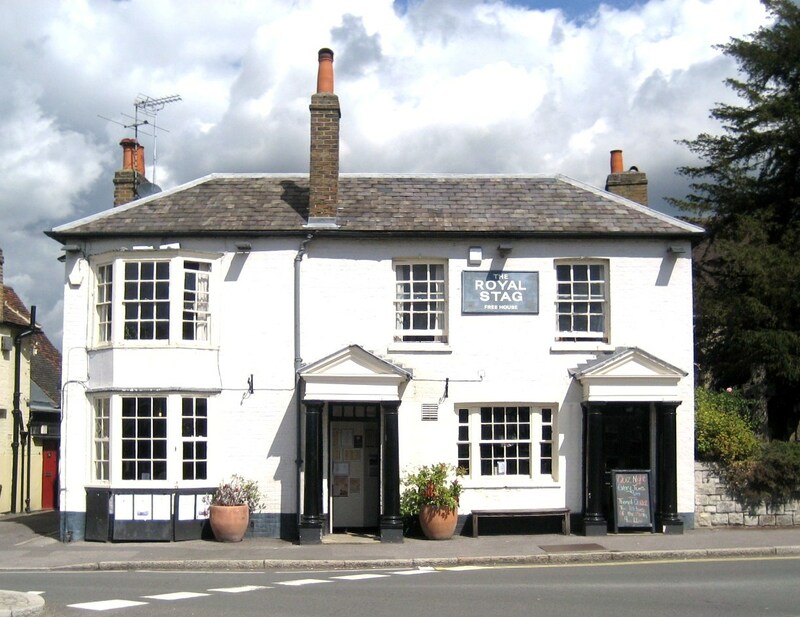 The Bridge House Trust still exists, and still owns the Royal Stag, but now spends the income on a wide range of projects of benefit to the whole community, most recently contributing to the rebuilding of the Thames riverbank. 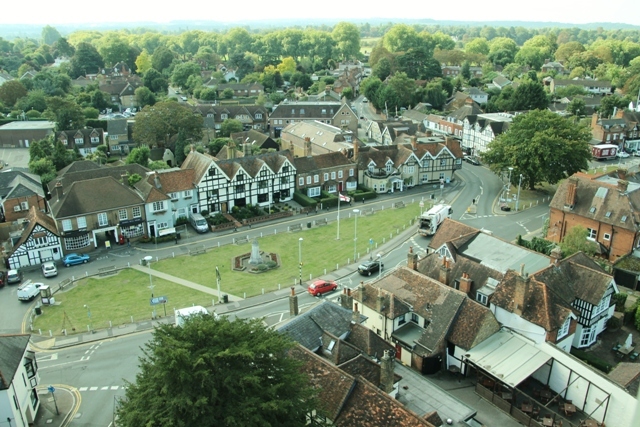 At lower L of map, Datchet Bridge over river and into the High Street. From top of map, Slough Road with water-course running alongside and becoming a pool. At top of High Street, BBHT bridge over pool to modern Pharmacy. Turn R to Royal Stag, then London Road to L, Horton Road ahead. The pool is then a stream as it runs beside Horton Road and under Green Lane at lower R of map.